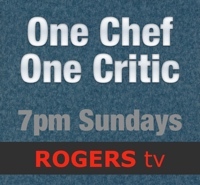 You won’t be surprised to learn that people often recommend restaurants to me. This summer I was visiting someone in hospital and a nurse pitched a restaurant operated by a former cook at the hospital. It’s called Crooked Phil’s Café. I made a note to check it out the next time I was in Carbonear. A few weeks ago I finally experienced Crooked Phil’s and its lunchtime cuisine. The Phil of Crooked Phil’s is Philip Combden. Phil and his missus, Dana Combden, have owned and operated the café since December of 2015. 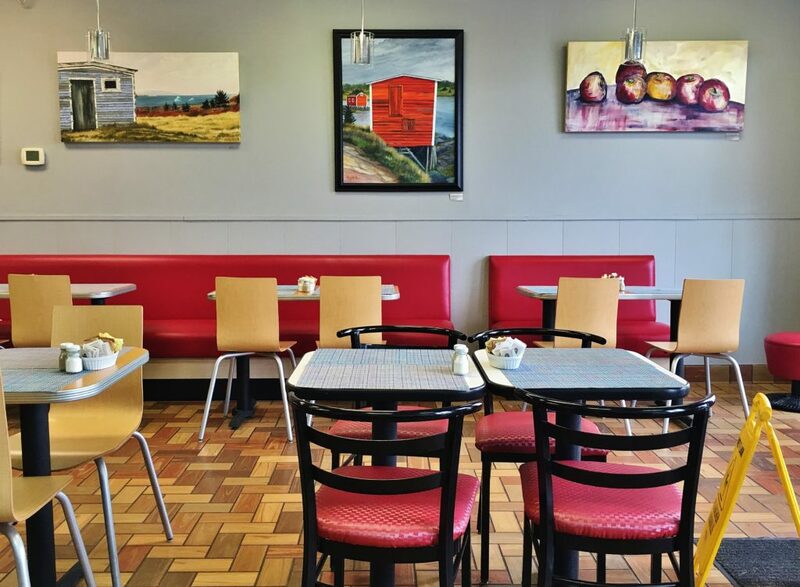 Their café is located in a strip mall on Carbonear’s busy Columbus Drive (across the road from the Trinity Conception Square Mall, next to Ches’s Fish and Chips). Inside, Crooked Phil’s is brightly lit, colourful and cheery. Red, black, grey, beige and various other shades of brown make up the colour scheme at Crooked Phil’s. It has a tiny hint of classic American diner about it. Many tables have aluminum edging and I spotted one or two leather stools. A red banquette provides seating for about four tables along one wall. Fairly large paintings (by local artists) cover much of the available space. What remains is taken up by red chalk boards, reserved for advertising the daily specials and other offerings. 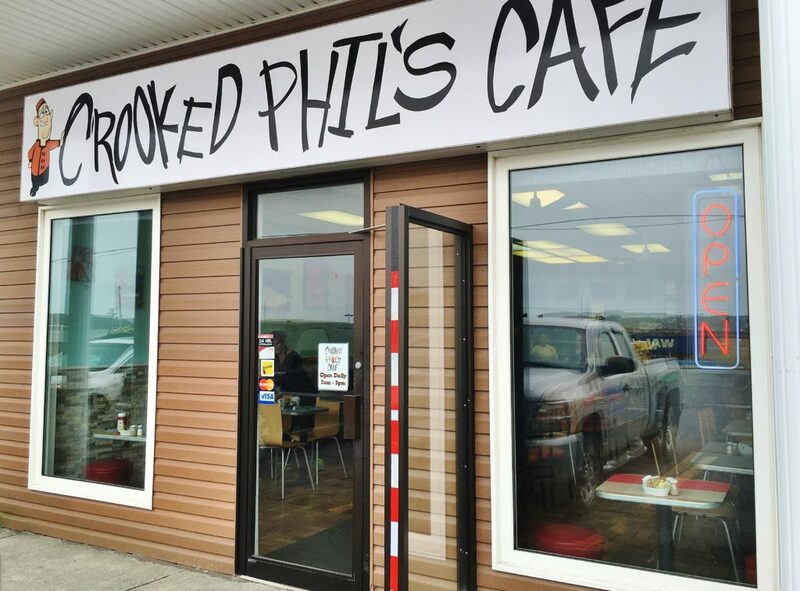 Crooked Phil’s opens early and closes at 3 p.m. I’m told breakfast traffic is brisk, probably because breakfast options are precious and few in Carbonear. Standard breakfast items involve eggs with various porky choices, including a Newfoundland favourite, fried bologna. Omelettes can be made containing any of a half dozen different ingredients. If you want a lighter kick-start to the day, fresh fruit and vanilla yogurt parfait are available. 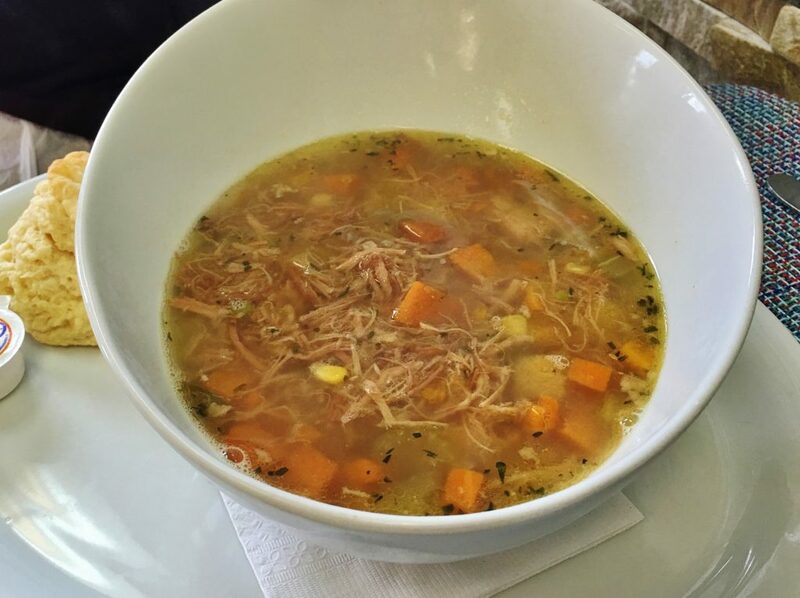 We showed up around noon, just in time for bubbling turkey vegetable soup and other Tuesday choices. Our waitress displayed her sense of humour when I asked if Phil (of Crooked Phil’s) really was, well, crooked. Her joking response, accompanied by a hearty belly laugh, was, “Is he ever, but his wife is nice.” A friendly server with a genuine sense of humour makes any restaurant experience much, much better. A turkey neck may not be the nicest looking poultry part but as an ingredient I’ve always felt the flavour from the bones and attached flesh made the neck a food item to relish. Braised with onions, or in stocks and soups, they’re terrific. It appeared Chef Phil had utilized turkey necks in his delicious turkey vegetable soup. I say this because I immediately recognized the long, narrow strands of dark meat, just like the ones I’d peel off the outside of a cooked neck when I was a kid. No doubt the bones (which had been removed) had contributed to the robust turkey flavour. Swimming alongside the strands of meat were diced carrots, turnip and other vegetables. I believe I tasted some Newfoundland savoury as well. Crooked Phil’s does big portions. There was enough soup in one bowl to feed several hungry mouths. My friend Shirley, in nearby Whiteway, swears by Phil’s turkey soup. I think she would have swooned after tasting this particular pot. 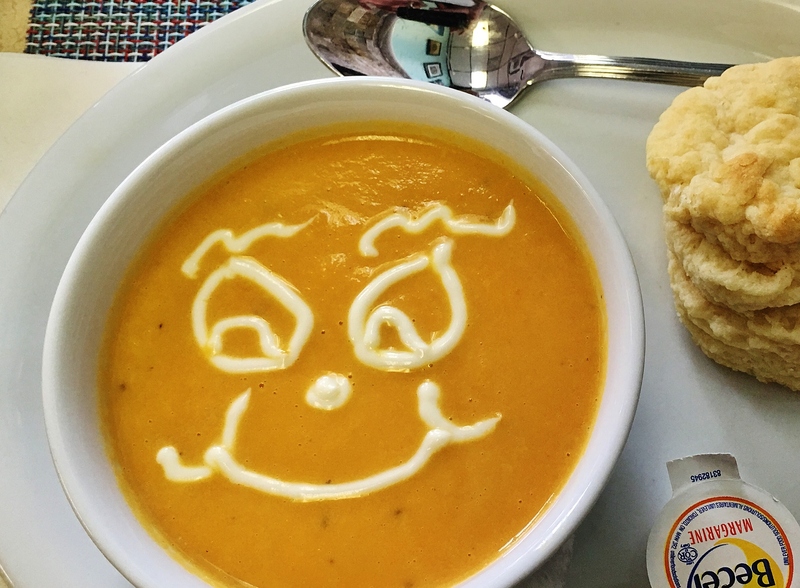 Another soup, carrot and ginger, arrived with a face painted on it by utilizing a squirt bottle filled with thickened cream. It was a smiley face, complete with nose and eyebrows. Seeing a frothy heart shape on top of my cappuccino is one thing, but I prefer my soup decorations to be abstract. (Although, I did appreciate the effort.) Meantime, the thick soup certainly did taste of fresh carrot. Ginger, on the other hand, as distinctive as it is, was barely noticeable. English scones, USA southern style biscuits (as in biscuits and gravy) and Newfoundland tea biscuits are all part of the same biscuit family. A couple of Crooked Phil’s very own flaky, buttery tea biscuits came with the soup. Unless they’re your gran’s tea biscuits, you won’t taste better than Phil’s. Later, I was tempted to order more to go with my cup of tea. 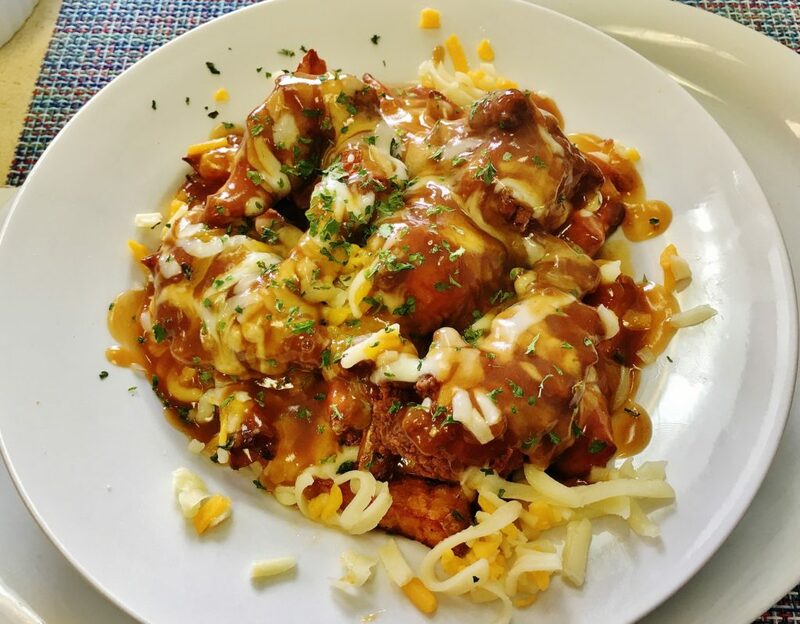 Crooked Phil’s was featuring a BBQ chicken poutine. I couldn’t resist. Somehow I thought I’d actually receive a version with fries, chicken that had been grilled or barbecued, cheese curds and BBQ sauce. Nope. Fries were out of sight, as in completely hidden at the bottom of the bowl. They were covered by breaded and fried pieces of chicken breast, slightly tangy, beefy gravy, shredded cheddar and mozzarella and a sprinkle of chopped parsley. The fries were too much of a soggy mess for me but, generally, the dish tasted good. There are no hard and fast rules for making poutine but the fries should never be taken for granted. Crooked Phil’s will serve you a full sandwich or a half sandwich with a bowl of soup. One of our group had half a club sandwich with soup. Half a sandwich was plenty. 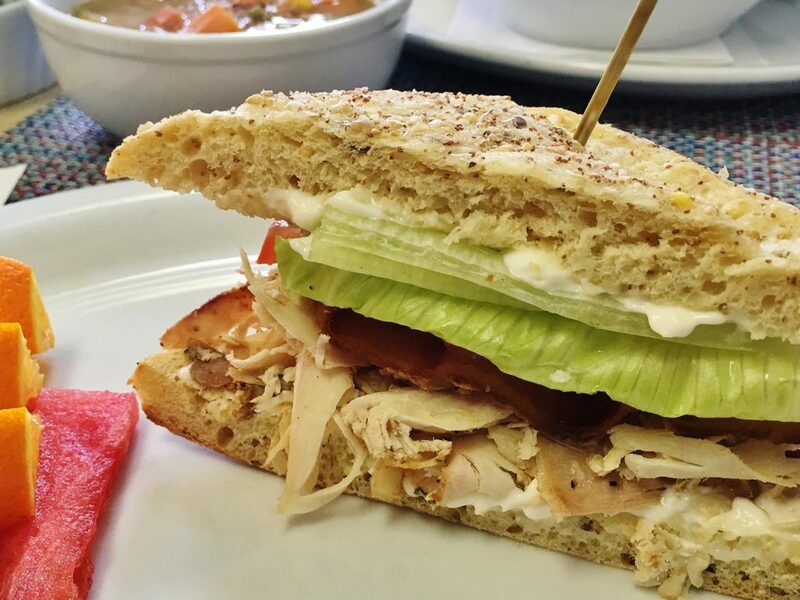 Slices and slices of fresh turkey, bacon, lettuce and mayo were stuffed between two pieces of tender focaccia. I’ve never been a huge fan of turkey sandwiches but this one was wicked. Phil may be crooked but his food is good enough to take the crooked out of the crookedest of customers. Price Lunch for two with appetizers, tax and tip costs approximately $35. Open Daily from 7 a.m. to 3 p.m. Specialty Tea, i.e. Buddha’s Blend, Alpine Punch, Cream of Earl Grey, Forever Nuts and more. Daily flavours of homemade lemonade are available, as well as flavoured iced coffee. Wheelchair access Crooked Phil’s is accessible.